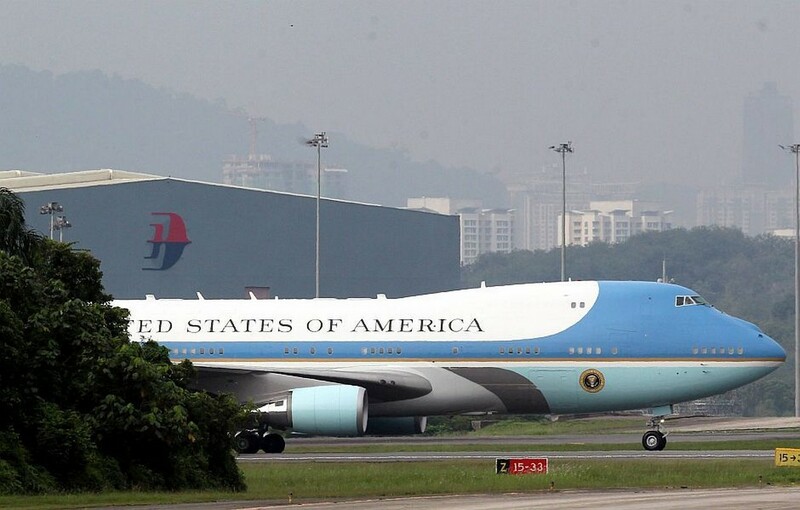 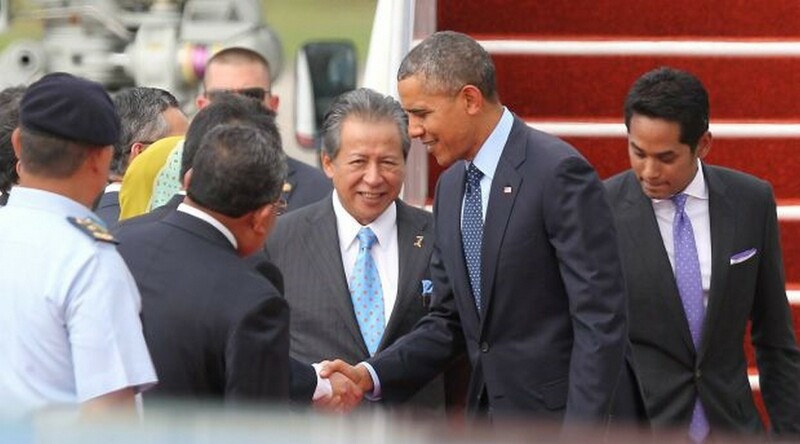 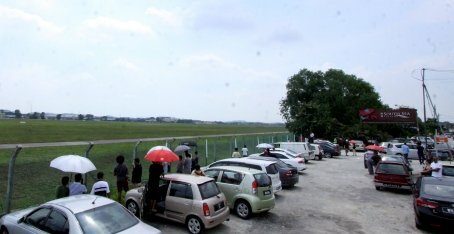 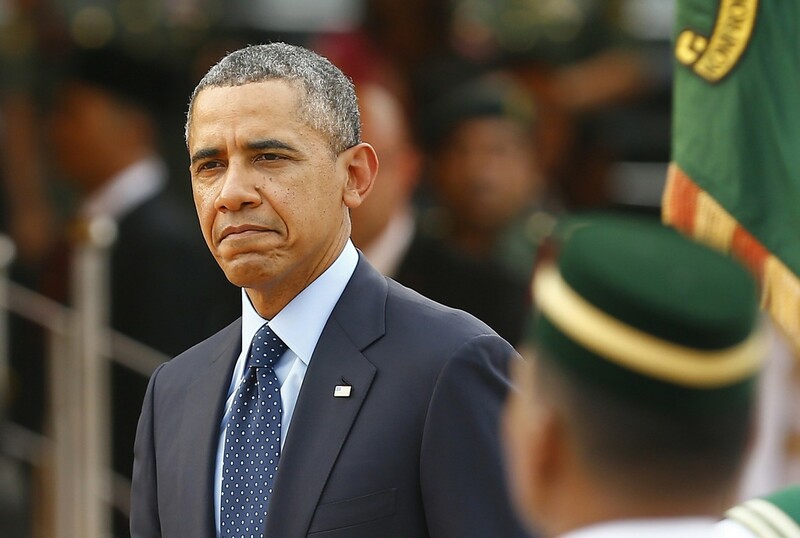 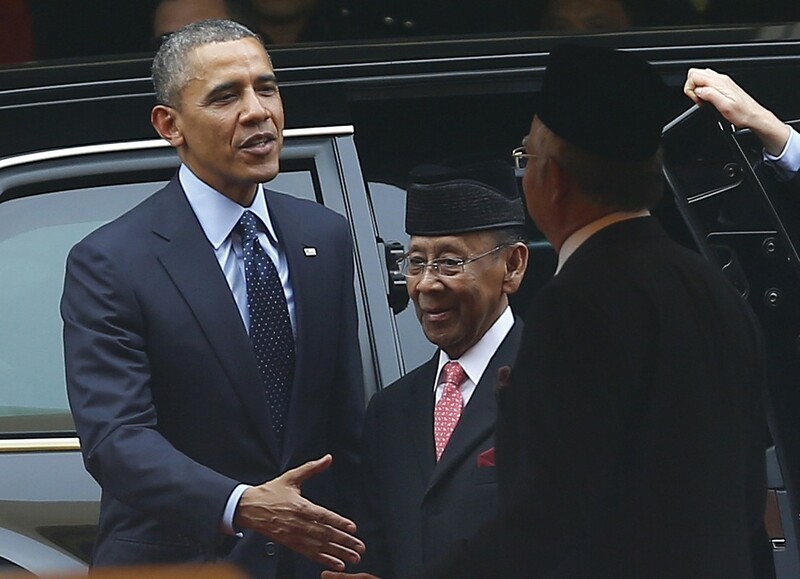 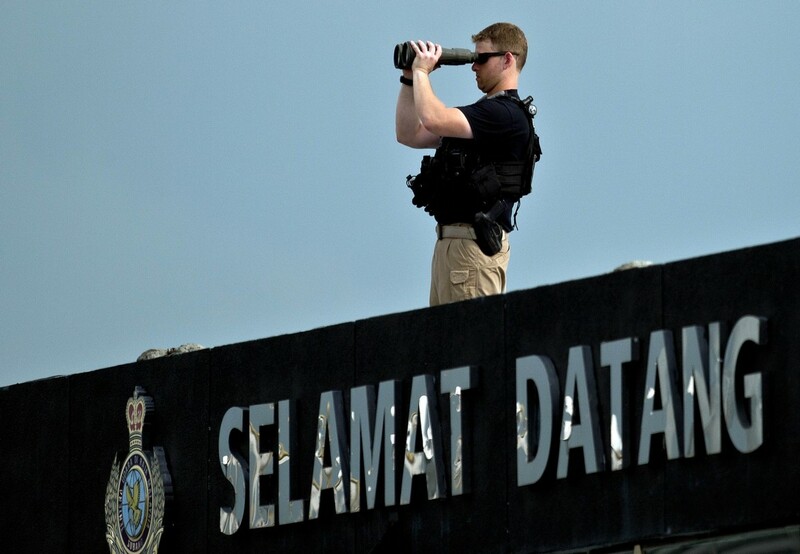 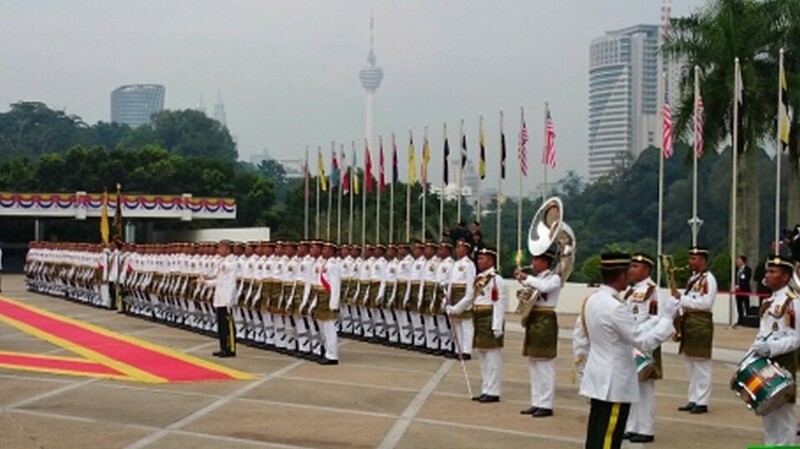 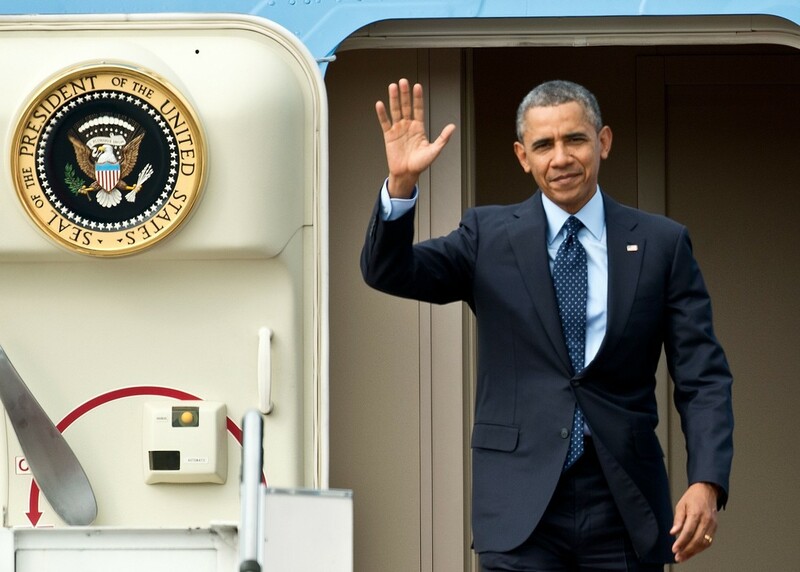 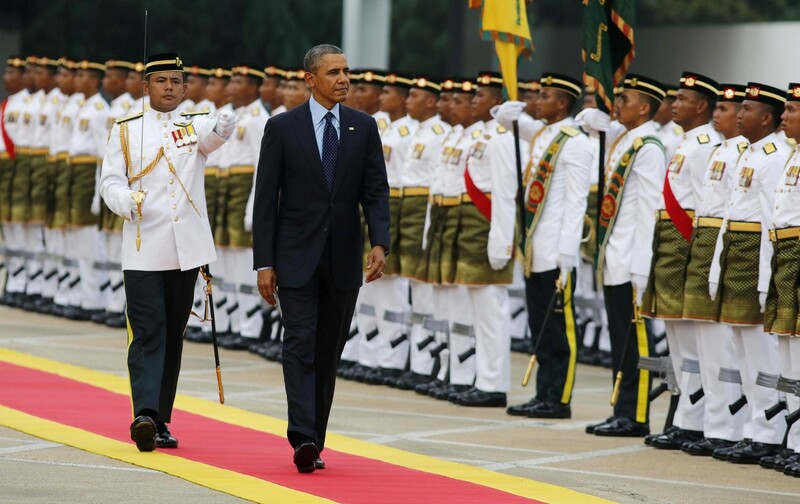 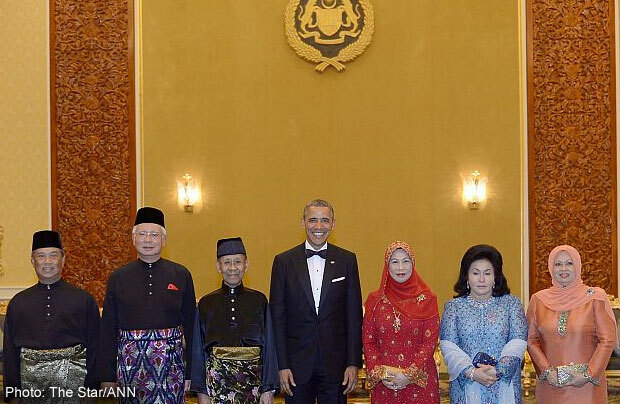 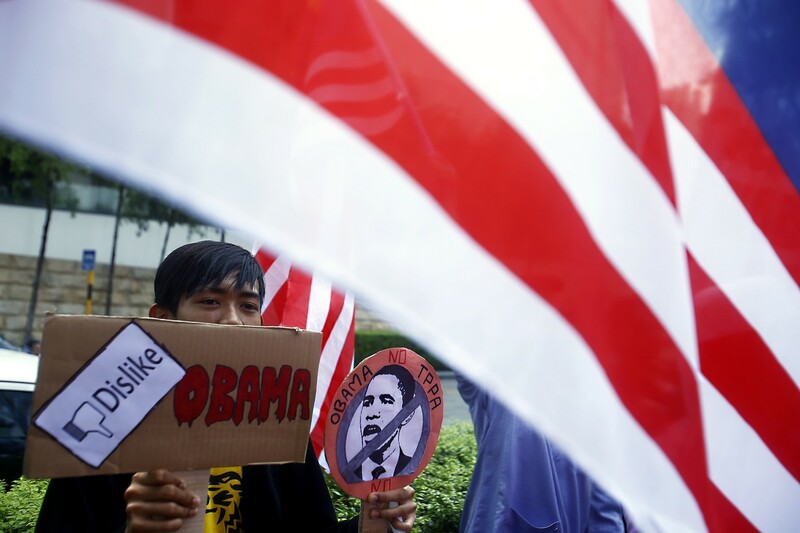 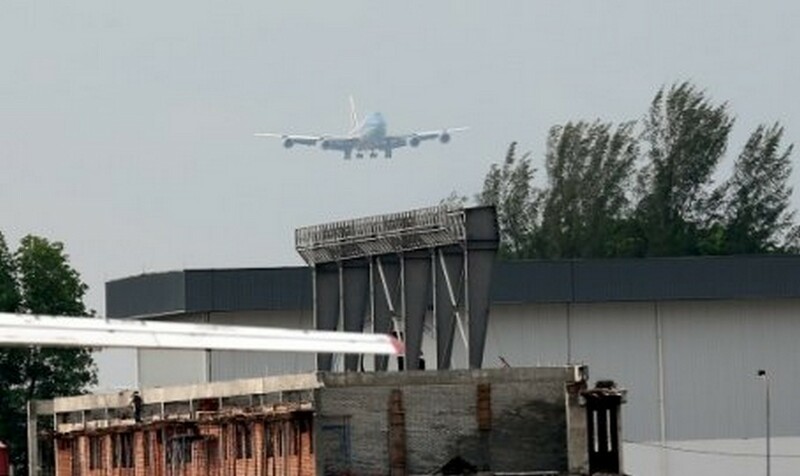 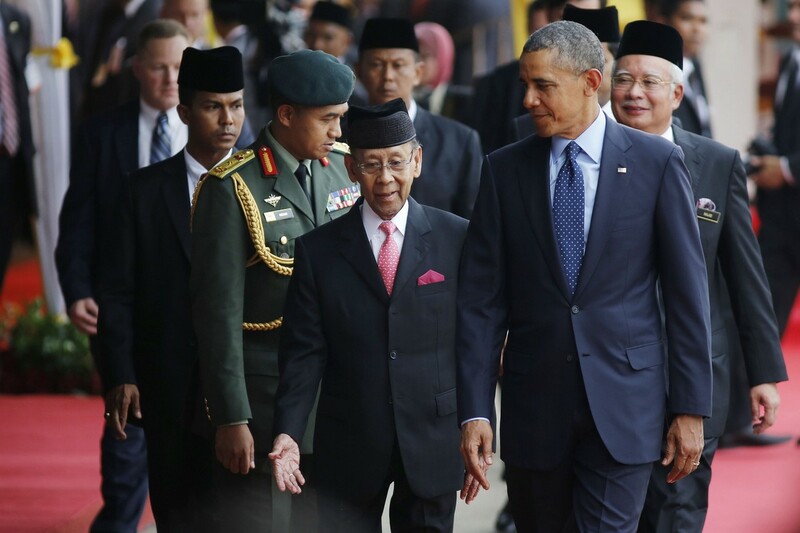 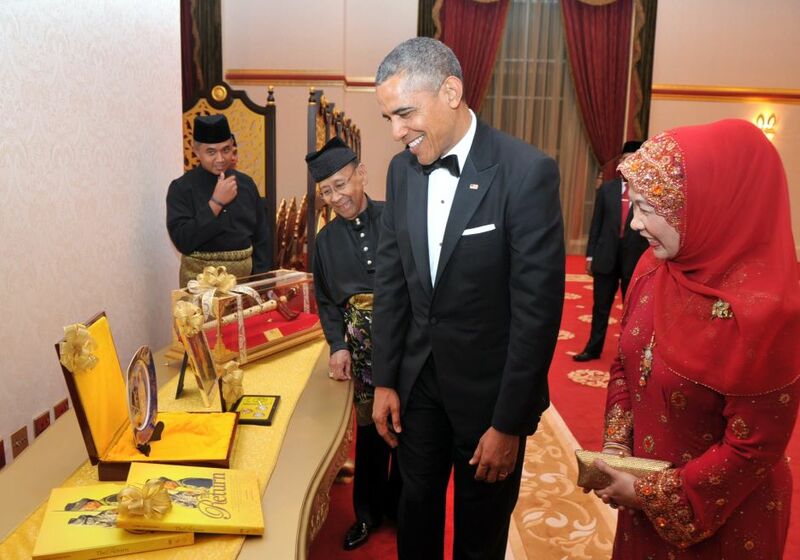 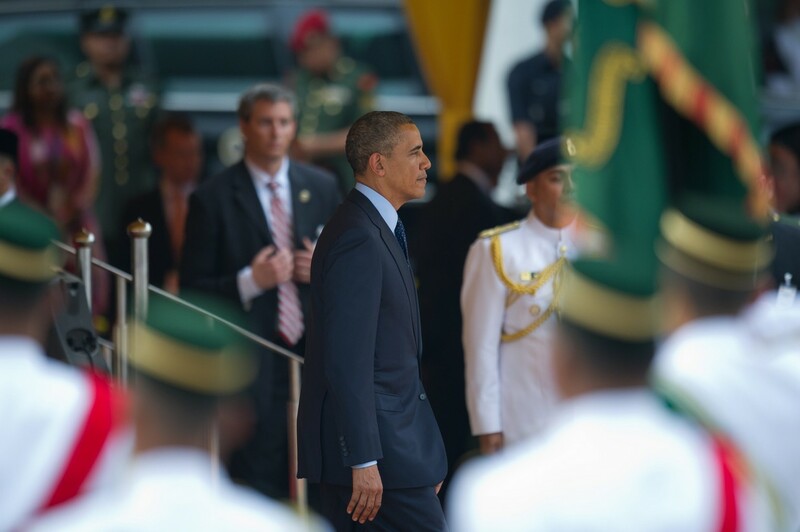 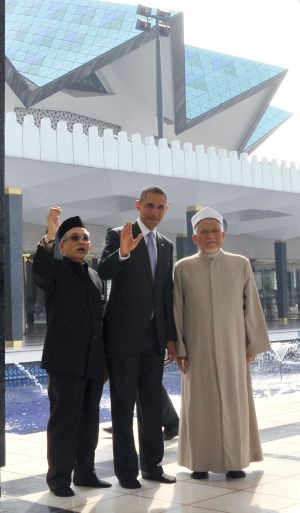 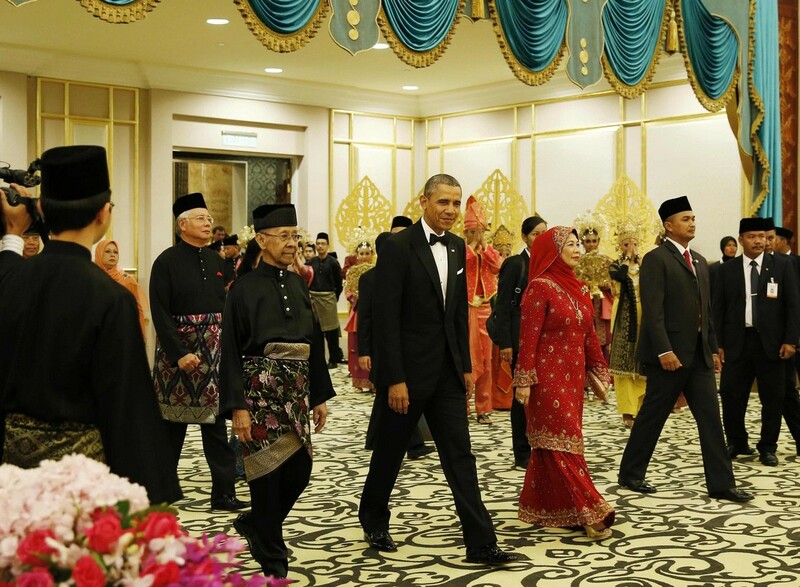 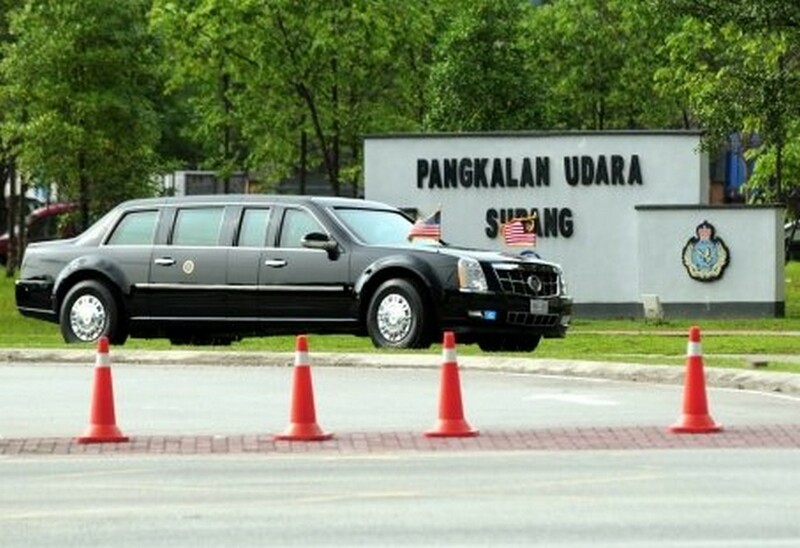 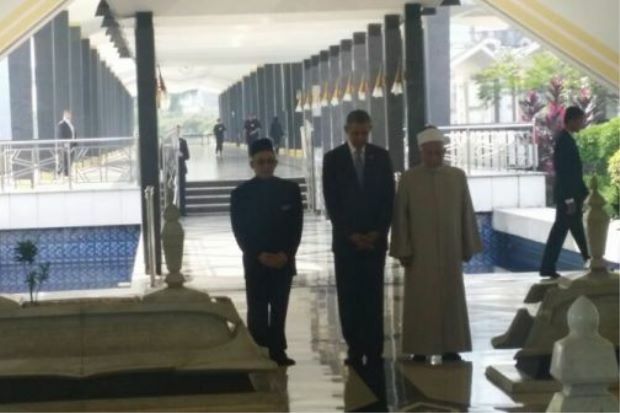 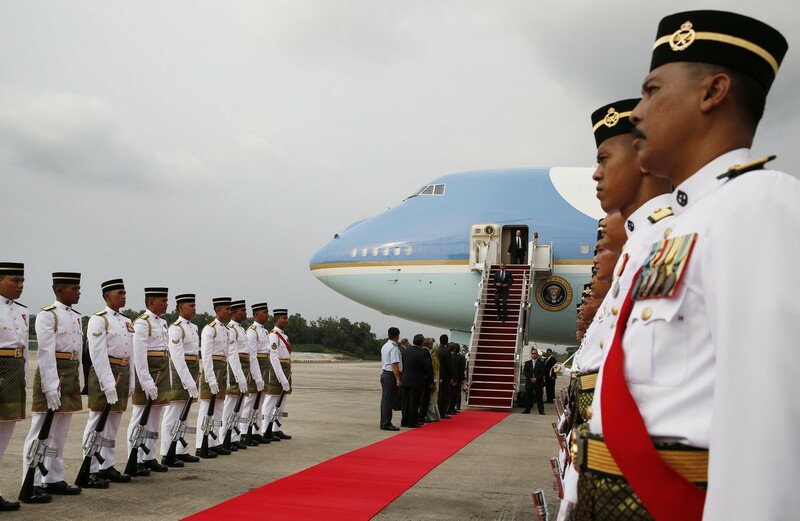 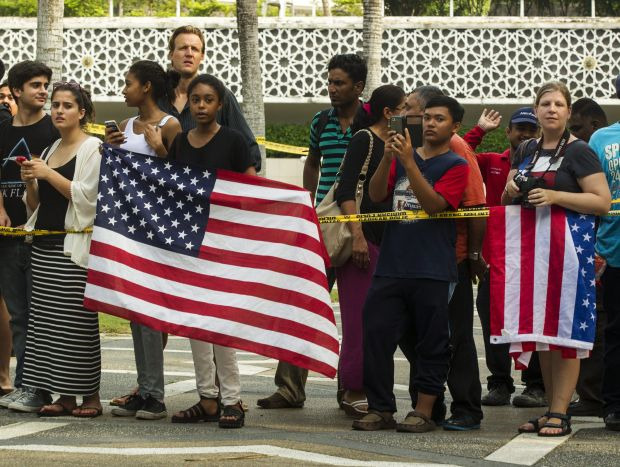 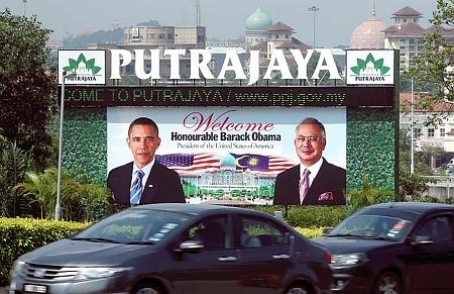 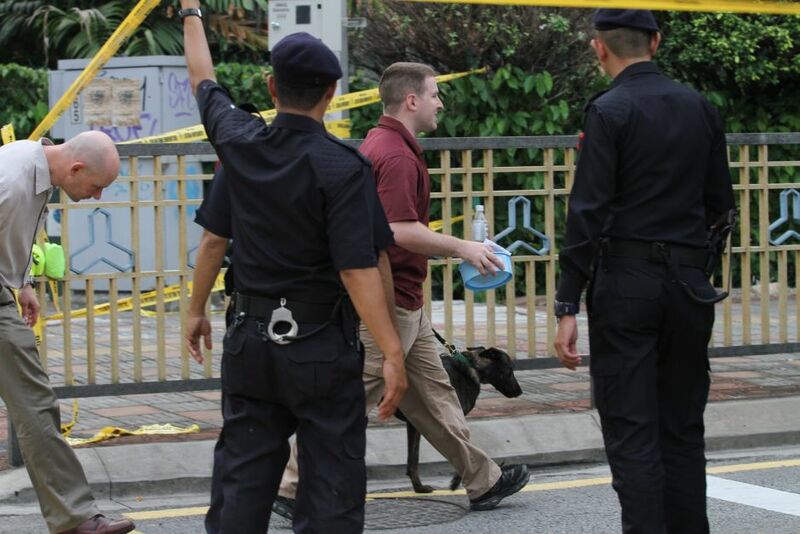 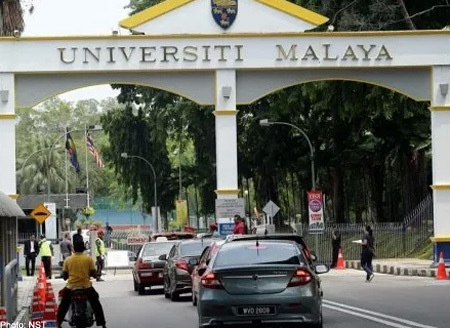 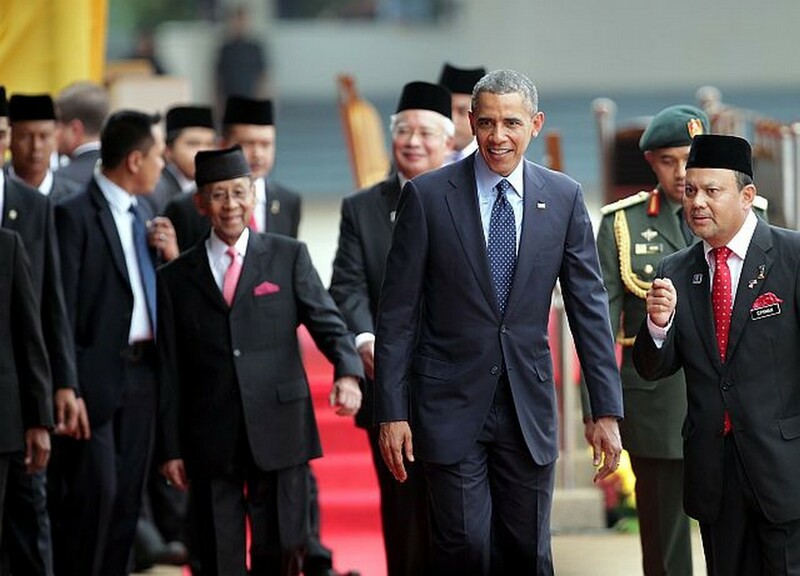 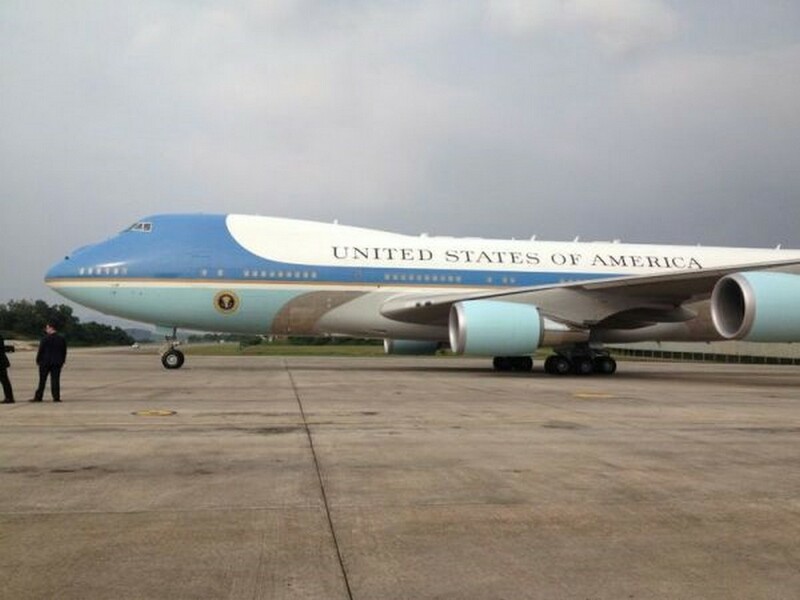 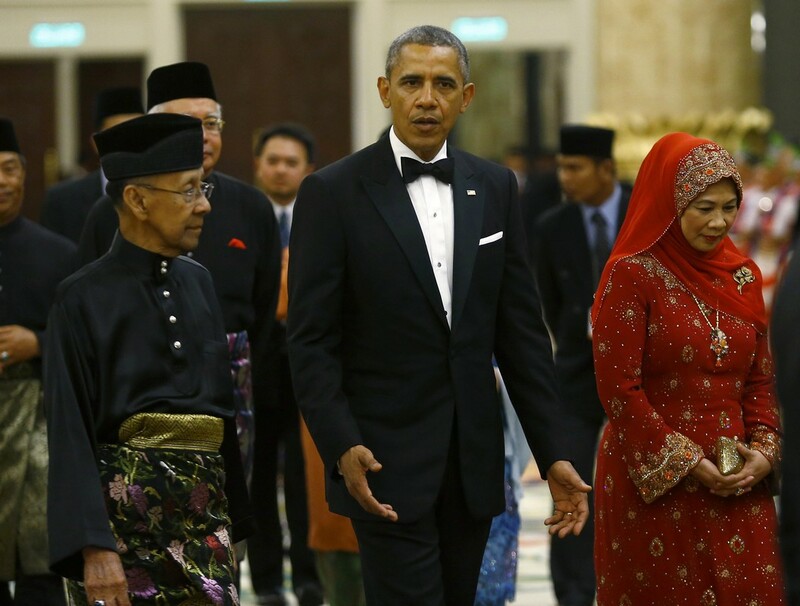 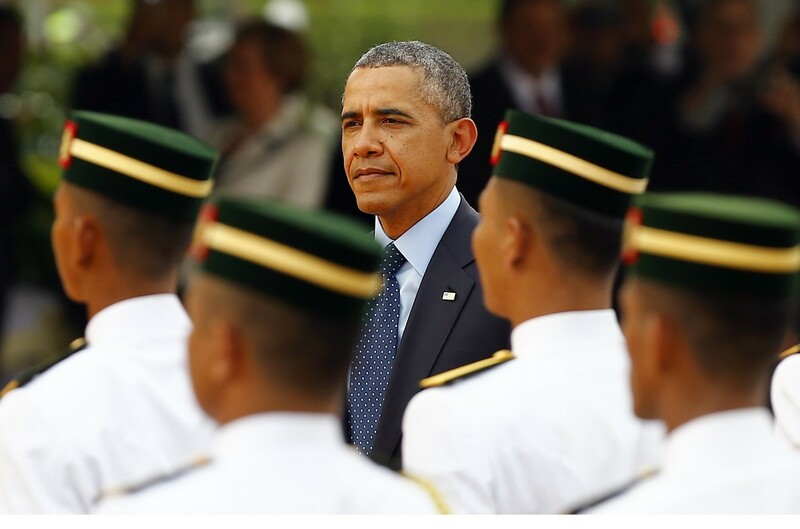 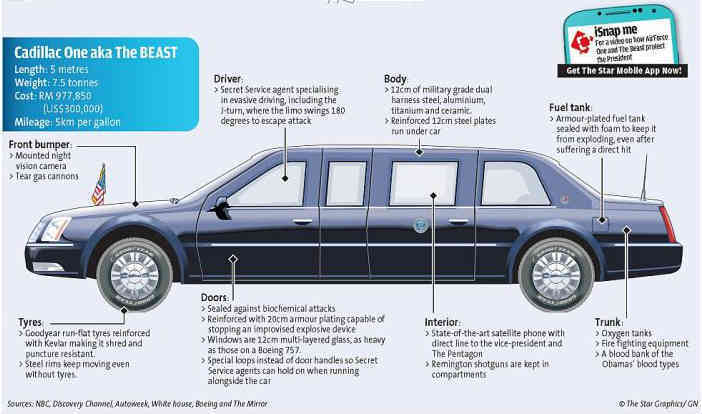 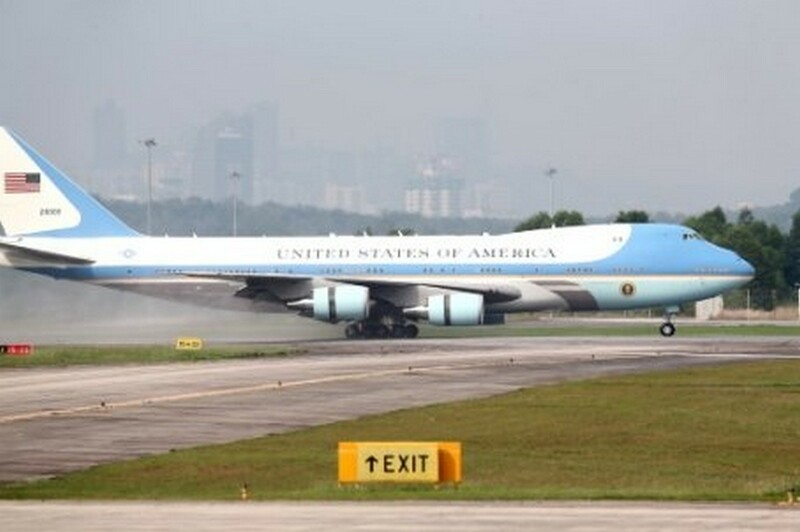 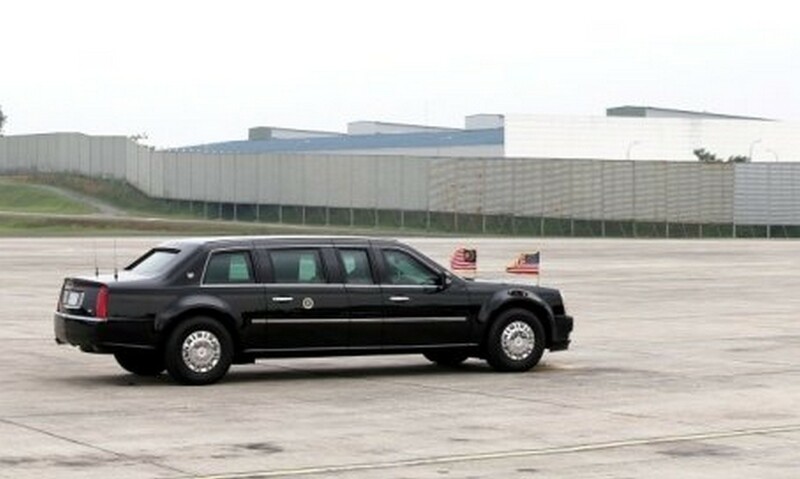 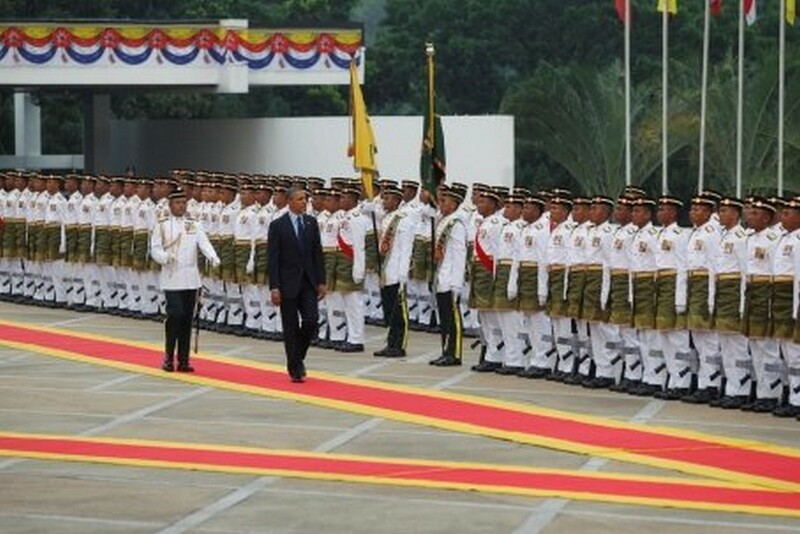 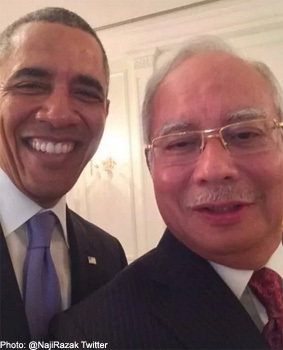 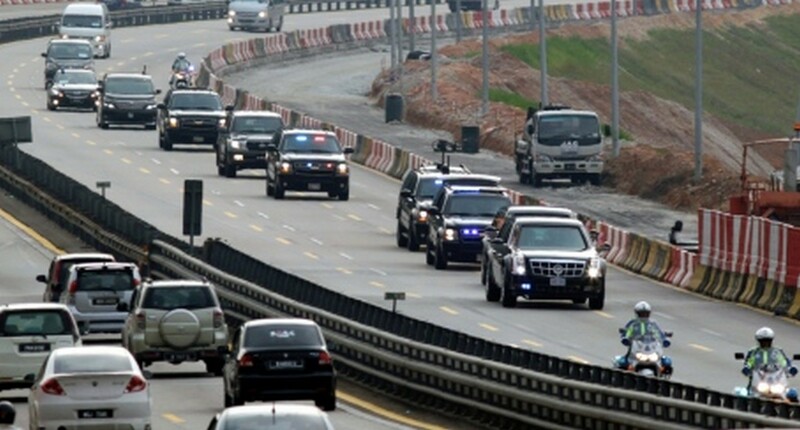 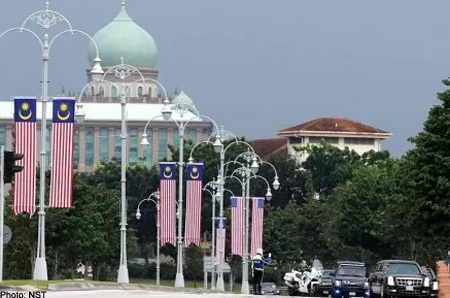 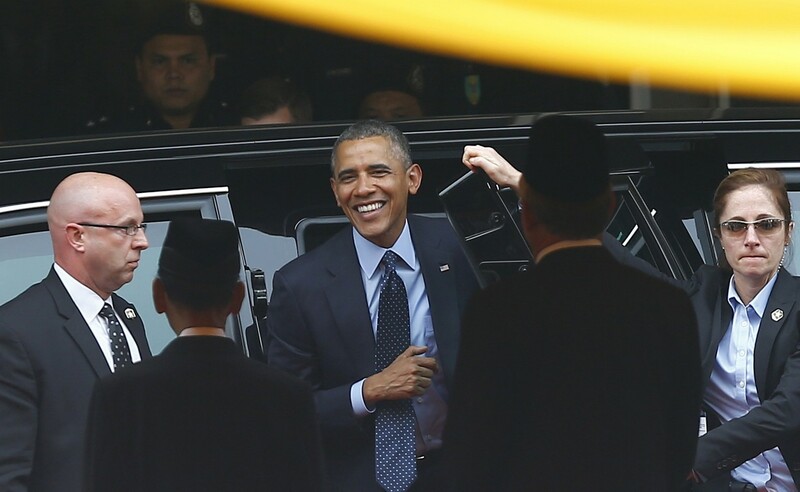 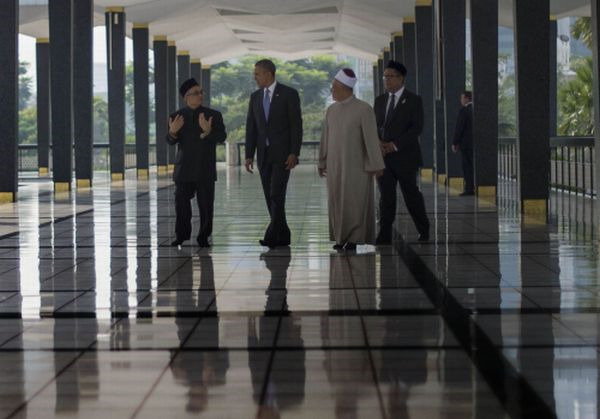 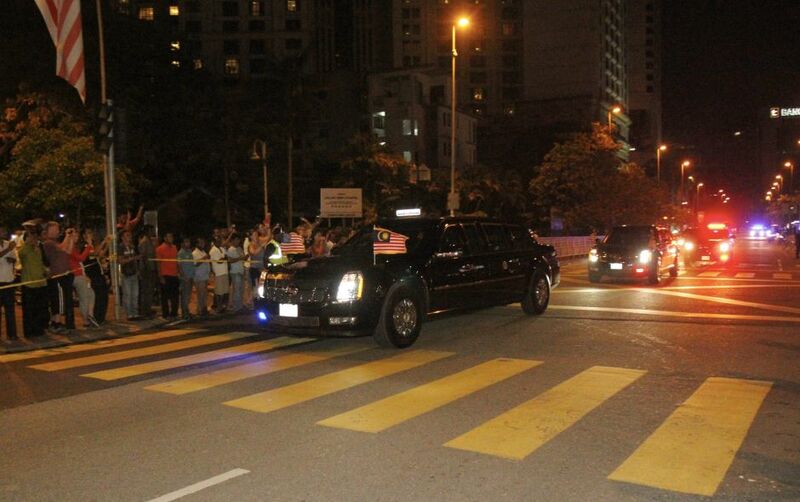 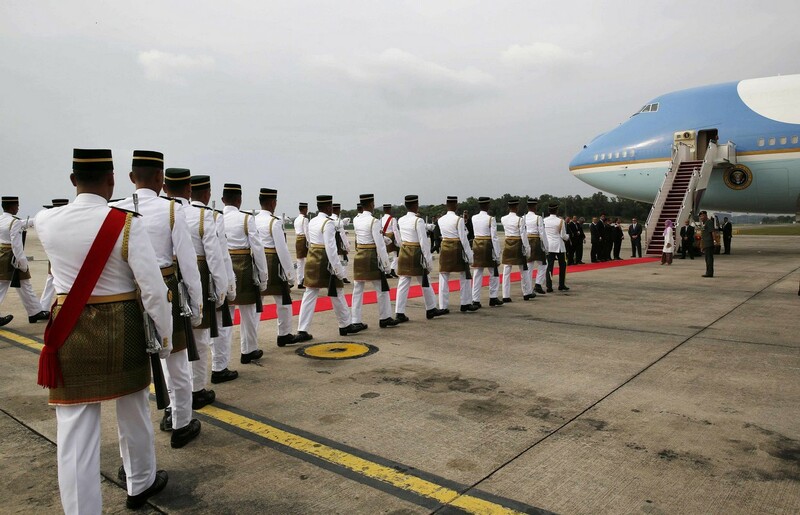 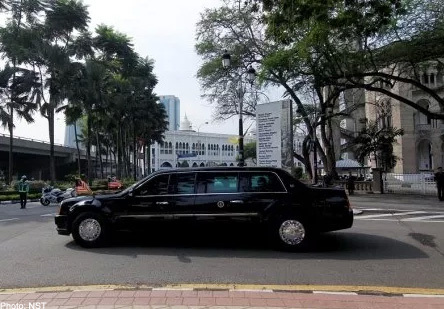 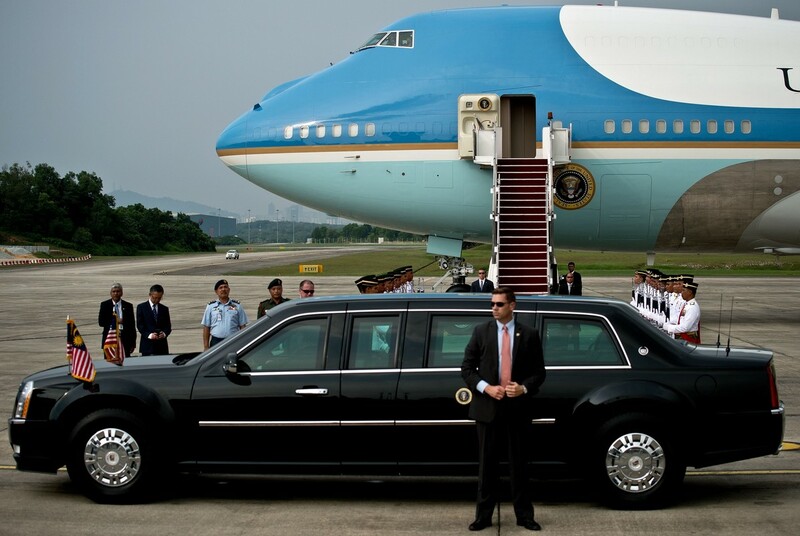 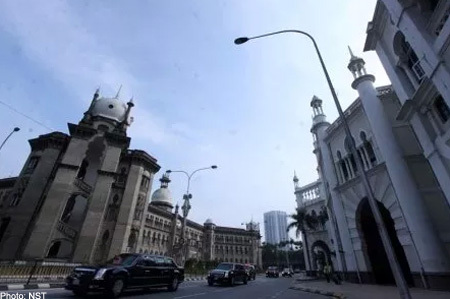 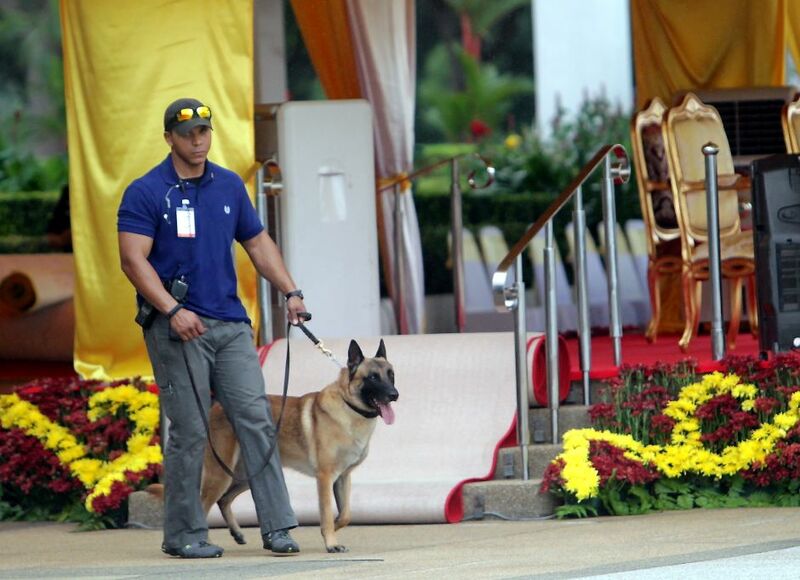 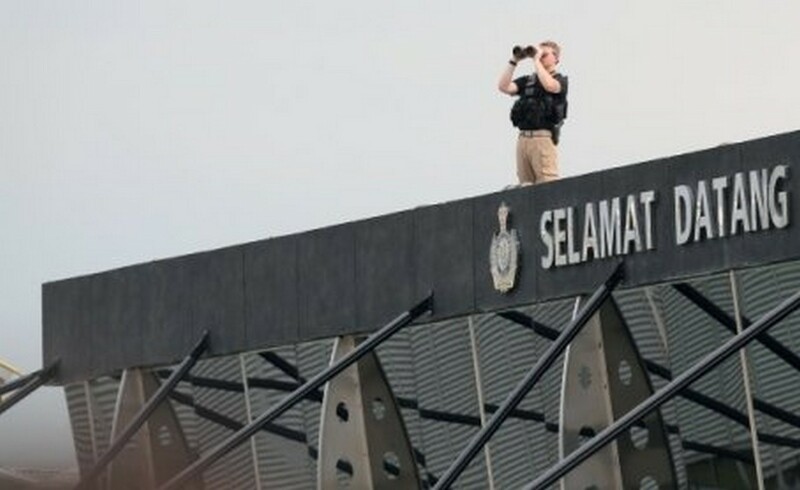 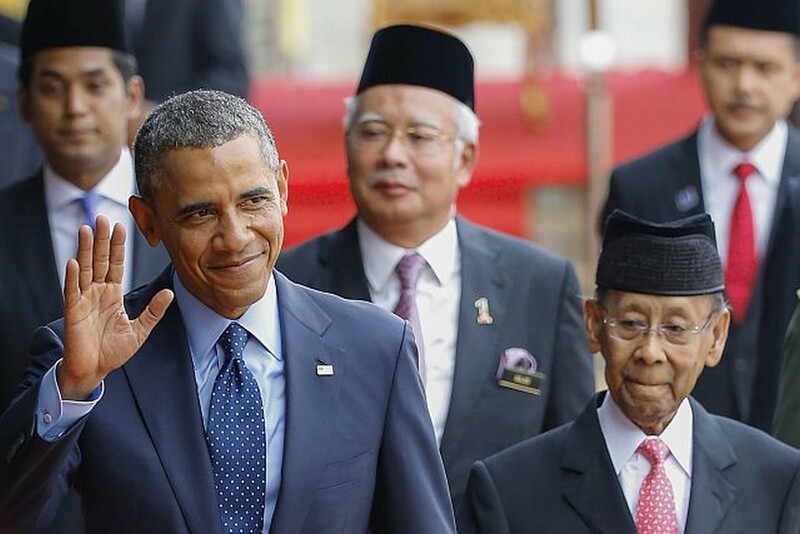 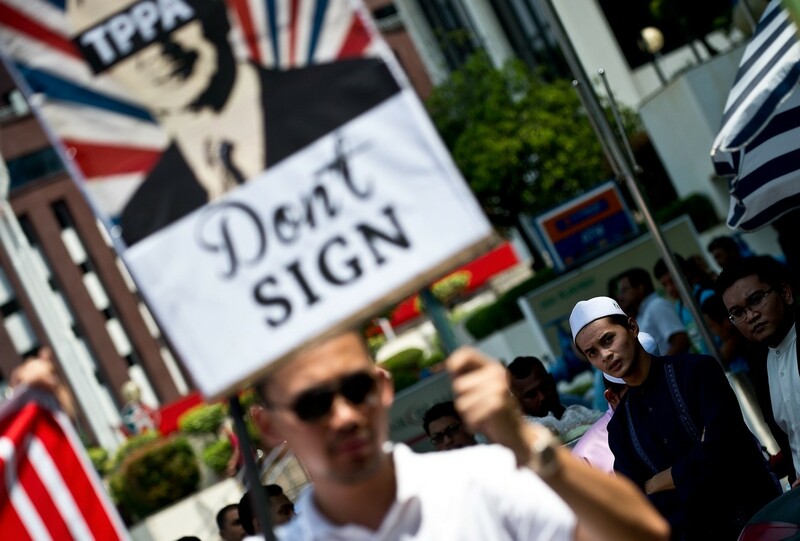 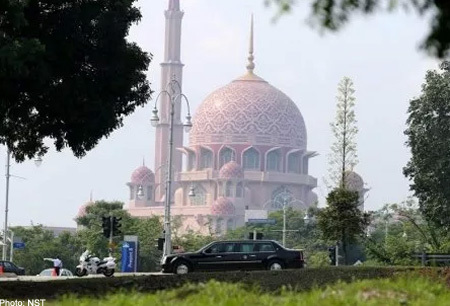 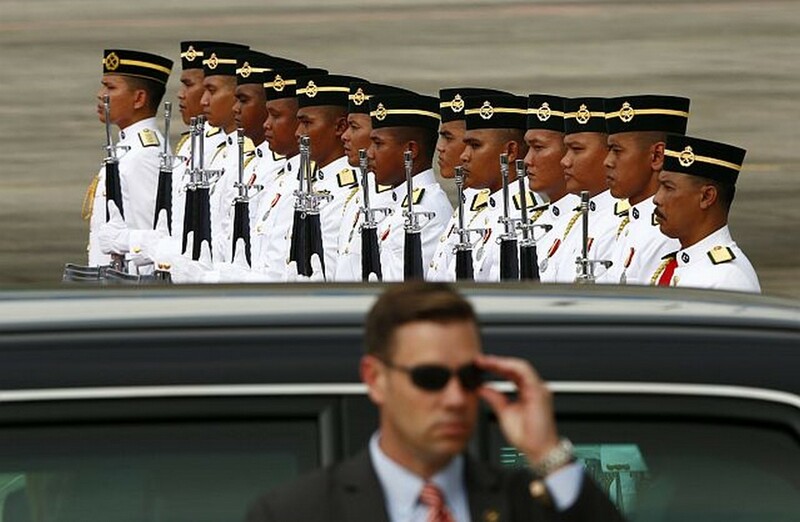 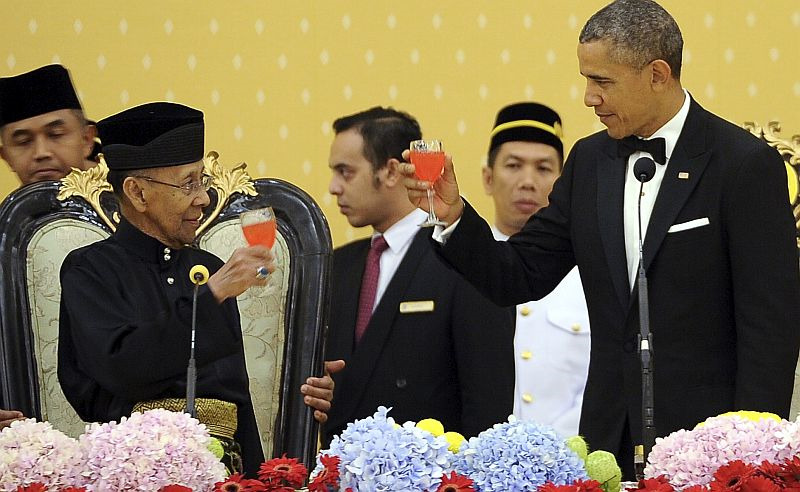 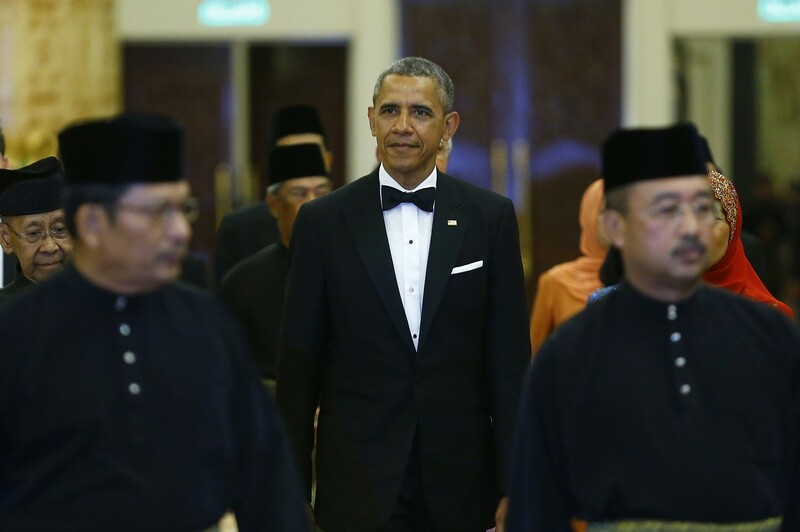 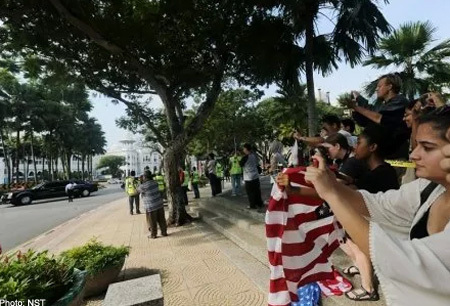 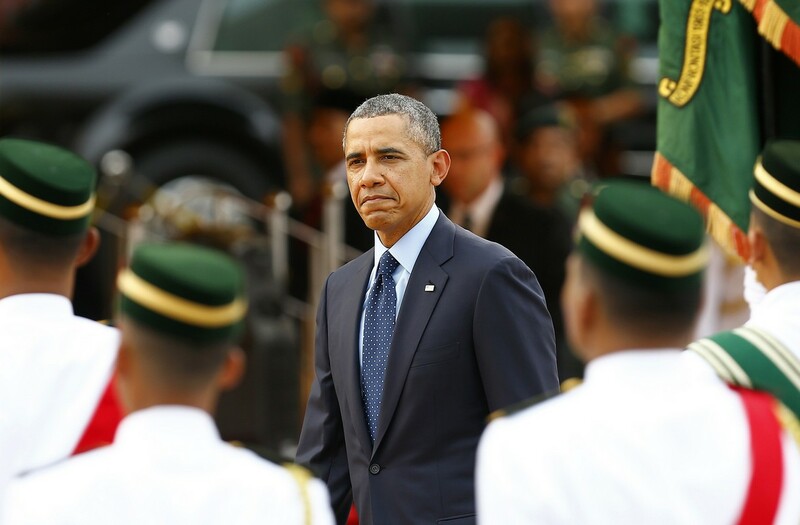 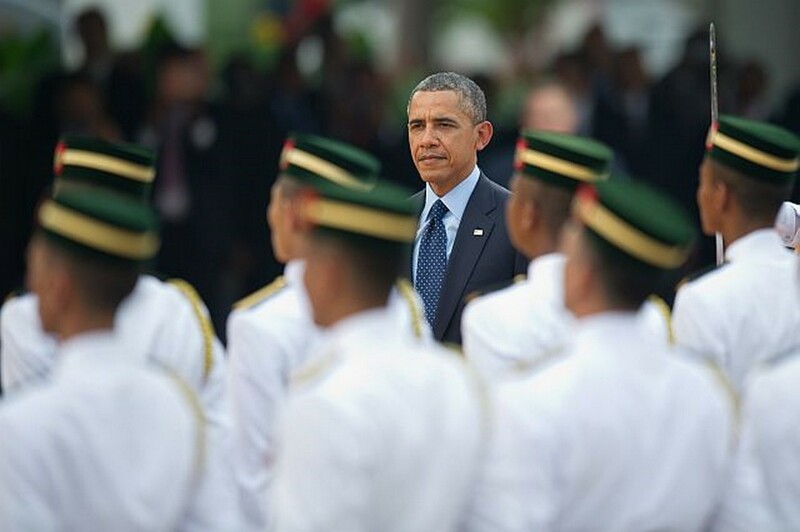 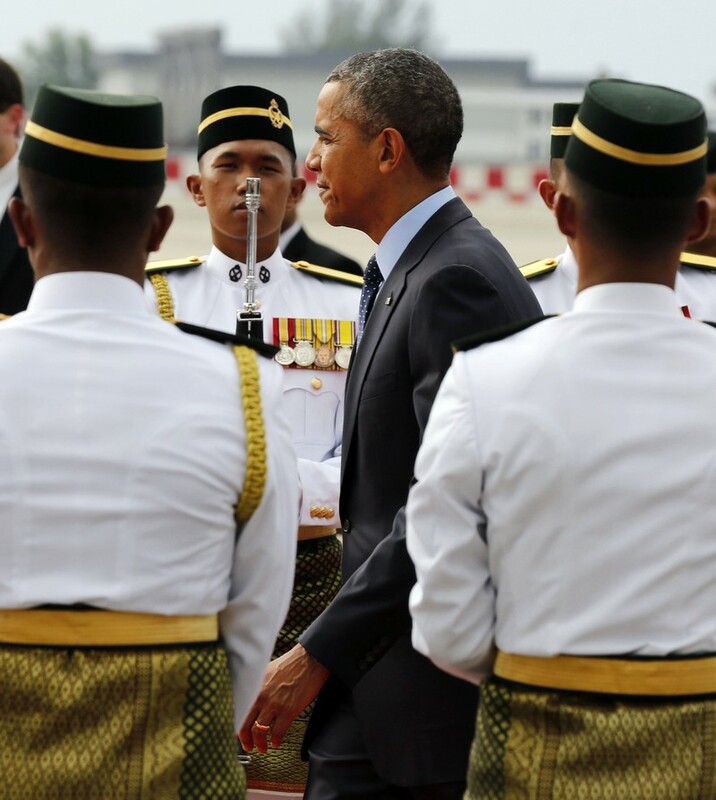 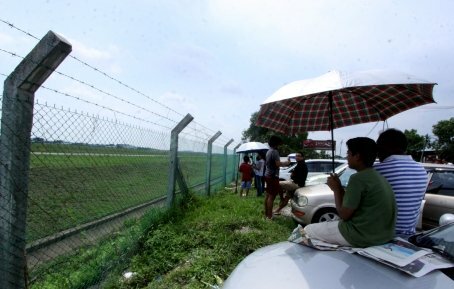 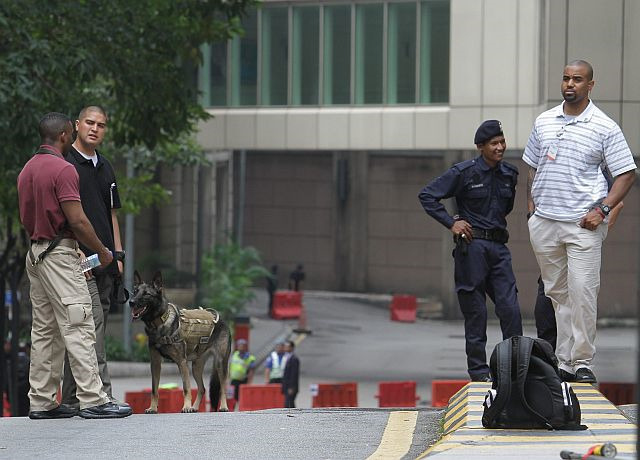 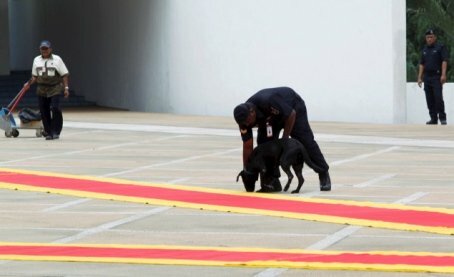 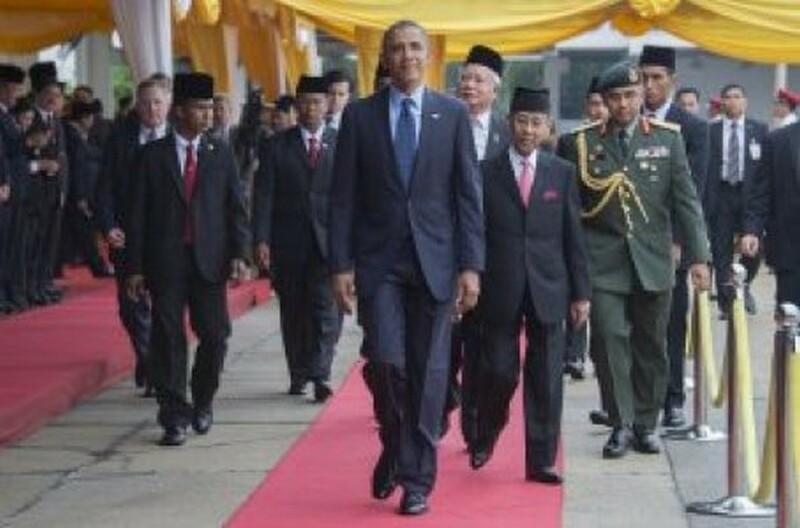 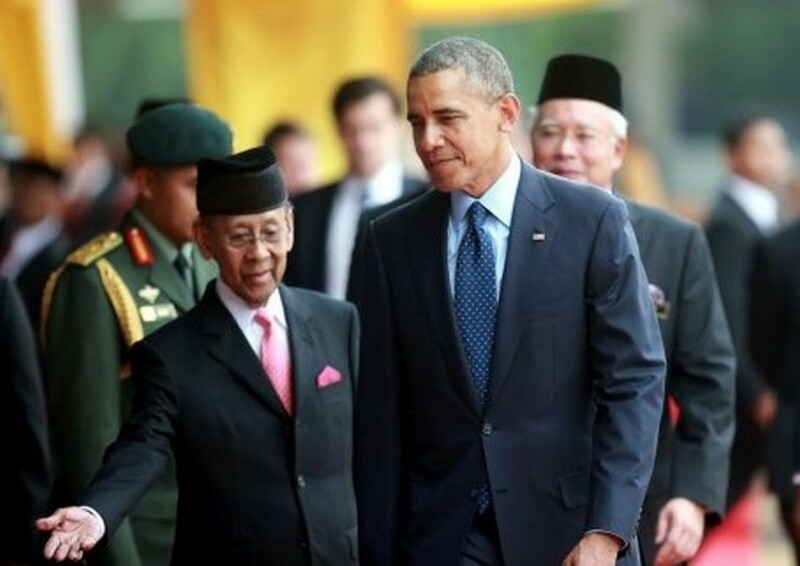 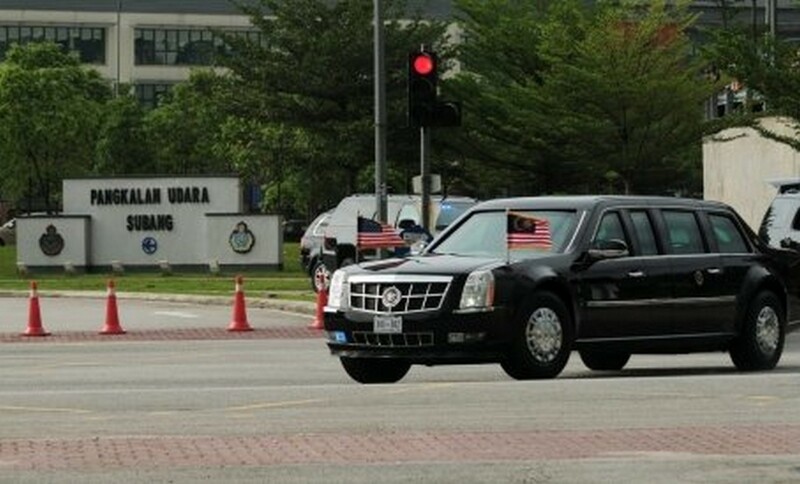 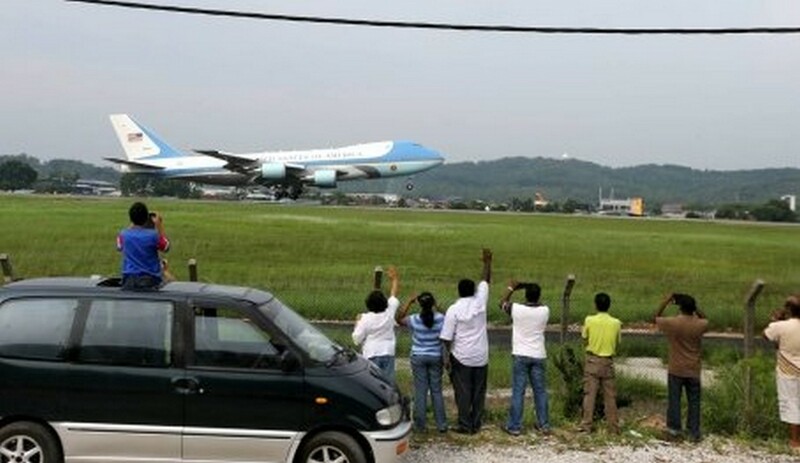 KUALA LUMPUR- President Barack Obama arrived at the RMAF base in Subang on Saturday for the much-awaited three-day visit. 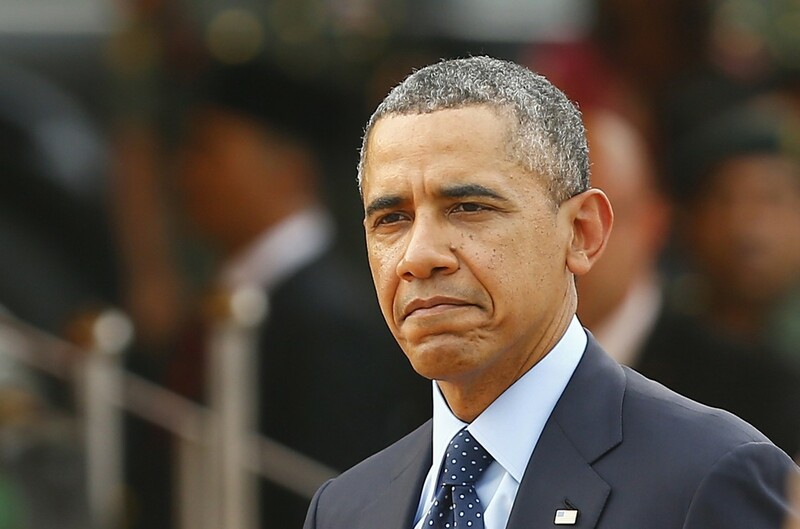 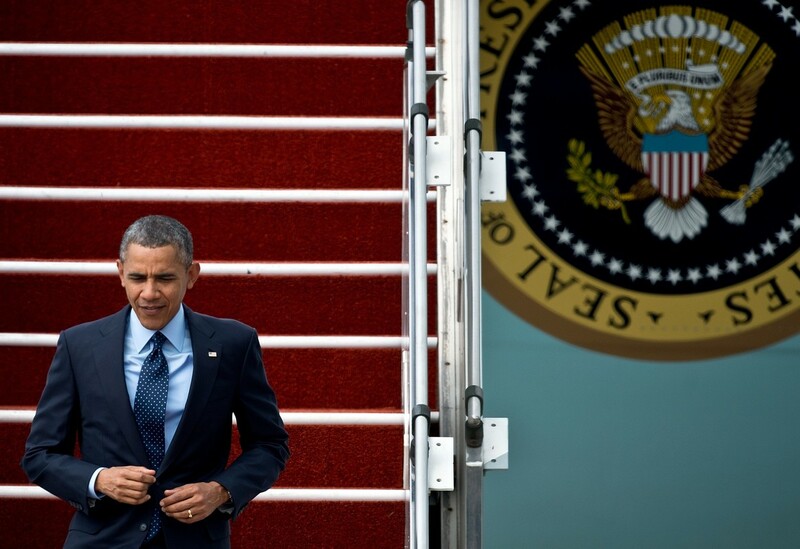 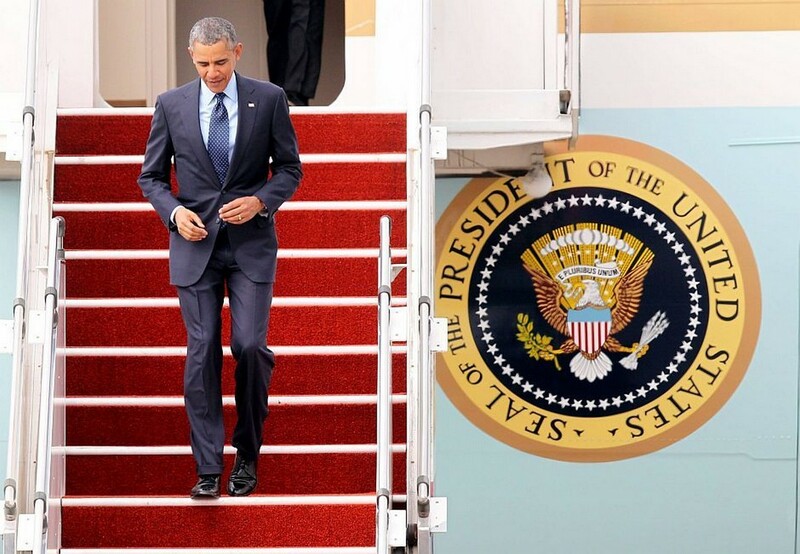 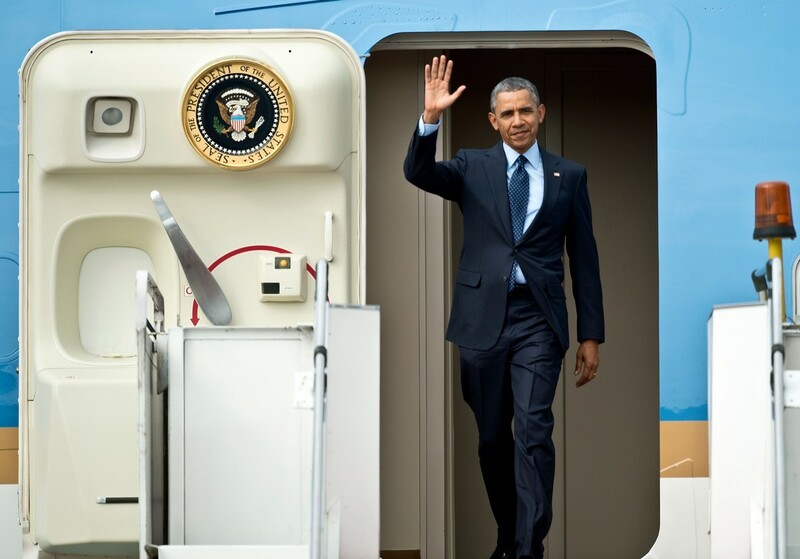 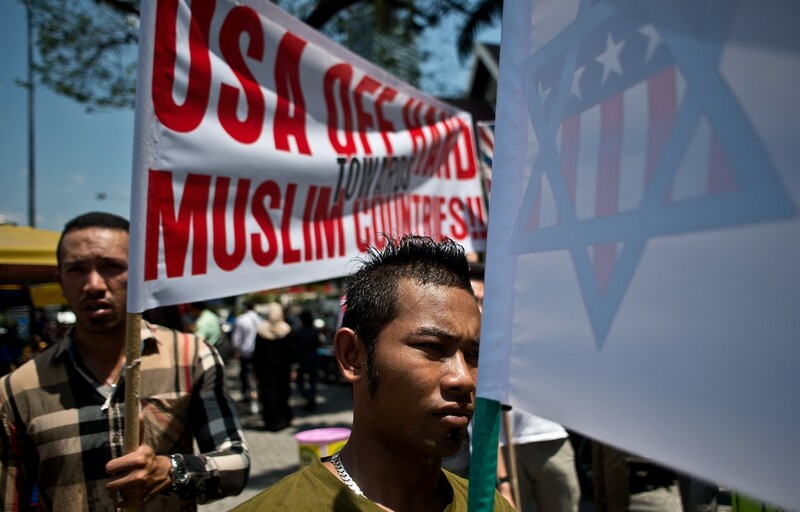 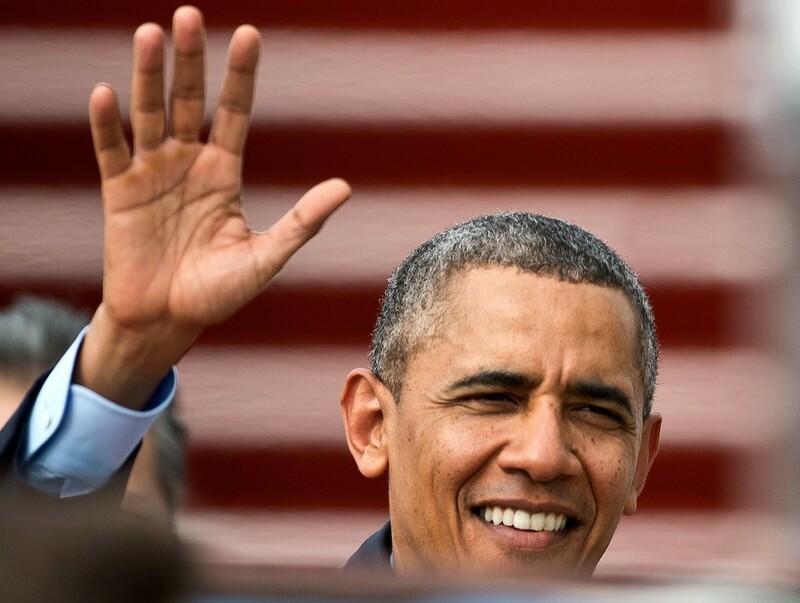 U.S. President Barack Obama greets U.S. 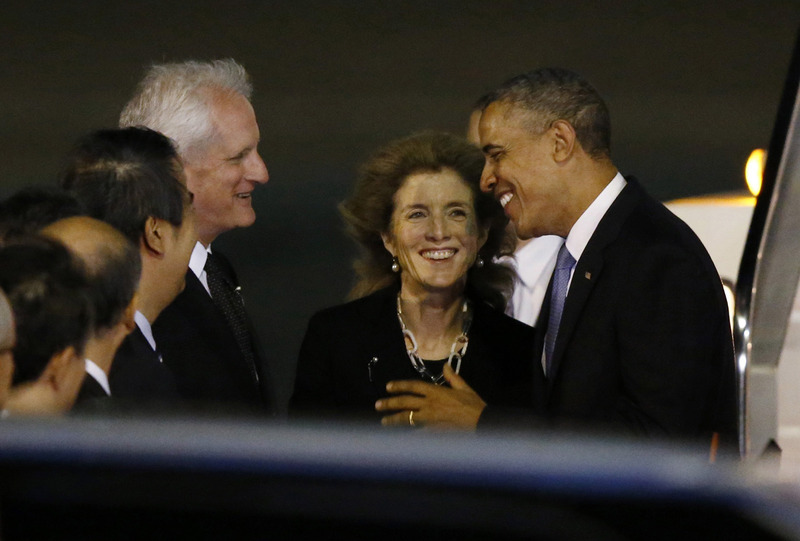 Ambassador to Japan Caroline Kennedy (C) upon his arrival at Haneda International Airport in Tokyo April 23, 2014. 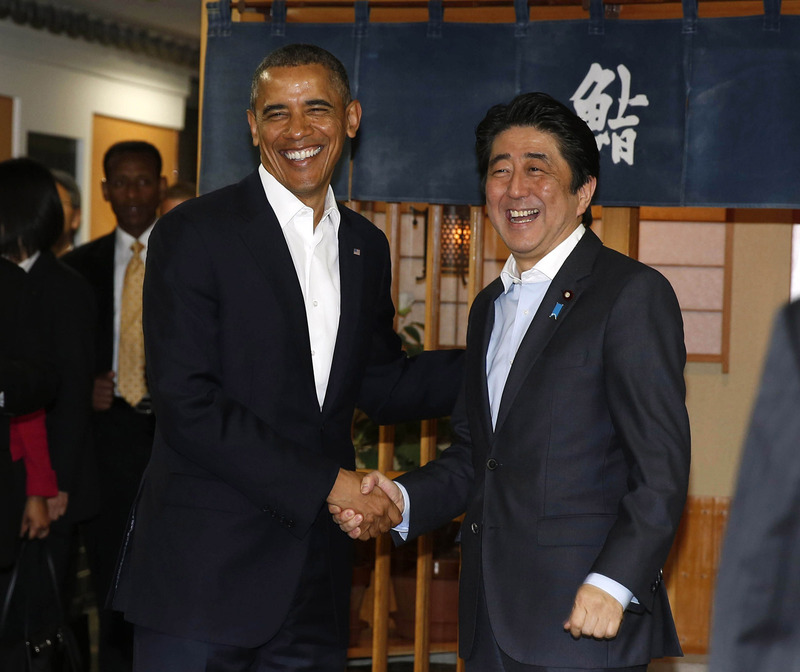 Obama's arrival in Tokyo on Wednesday evening brought parts of the Japanese capital shuddering to a halt amid tight security. 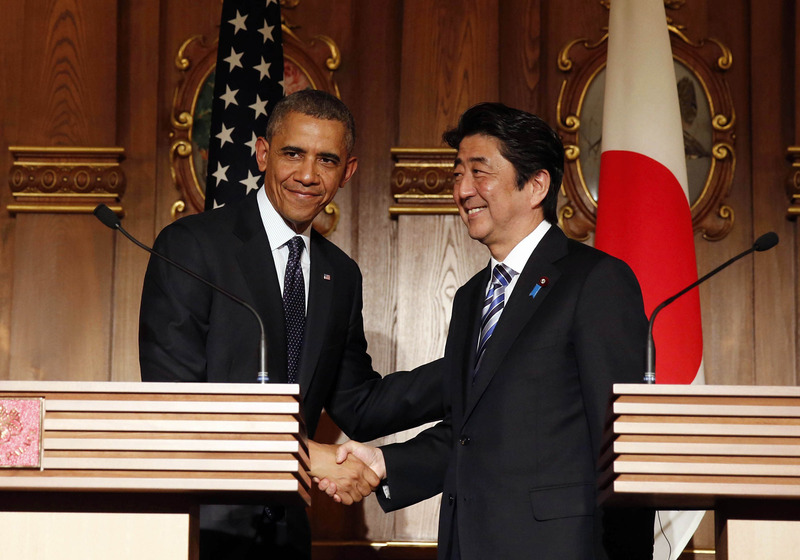 U.S. President Barack Obama shakes hands with Japan's Prime Minister Shinzo Abe (R) at a joint news conference at the Akasaka Palace in Tokyo April 24. 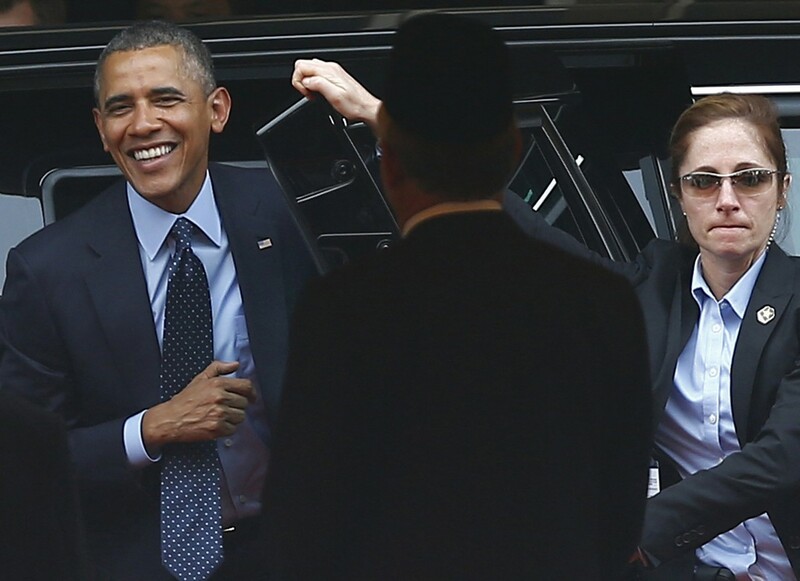 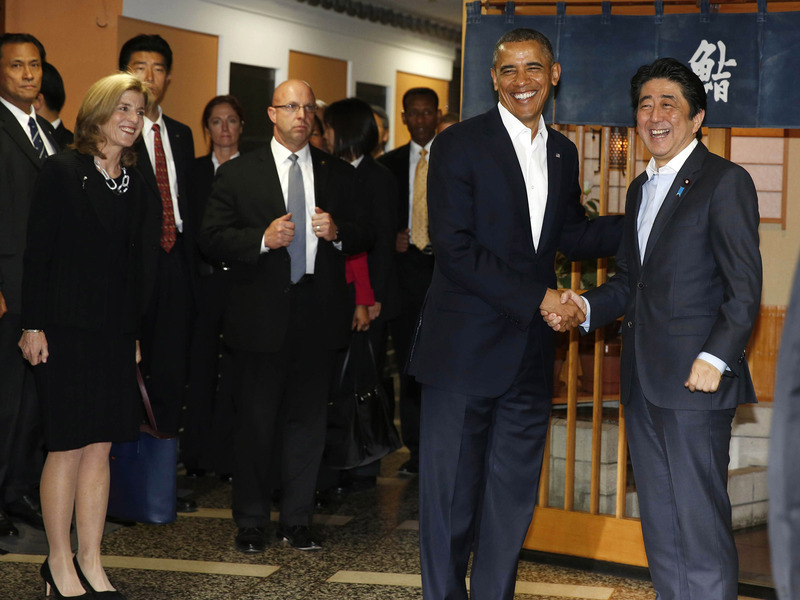 U.S. President Barack Obama is welcomed to Sukiyabashi Jiro restaurant by Japan's Prime Minister Shinzo Abe before dinner in Tokyo, Japan, April 23, 2014. 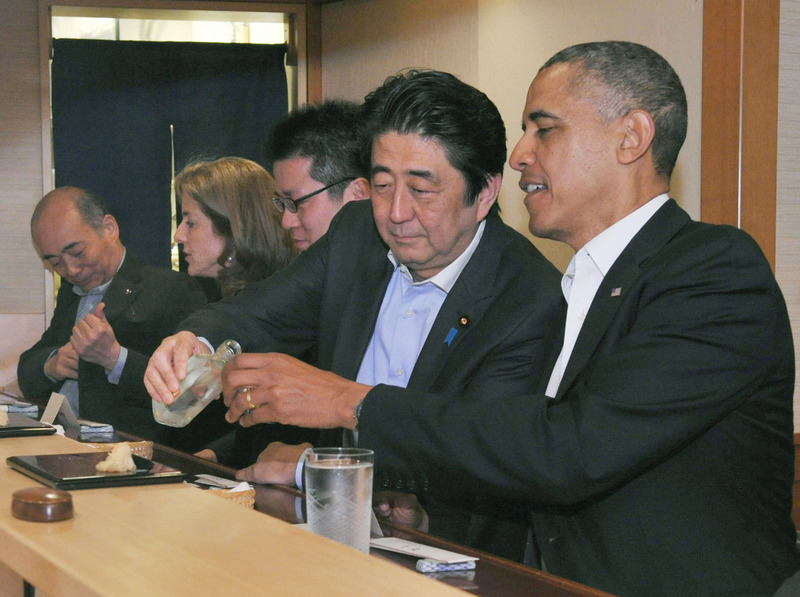 Japanese Prime Minister Shinzo Abe (2nd R) pours sake for U.S. President Barack Obama (R) as they have dinner at the Sukiyabashi Jiro sushi restaurant in Tokyo. 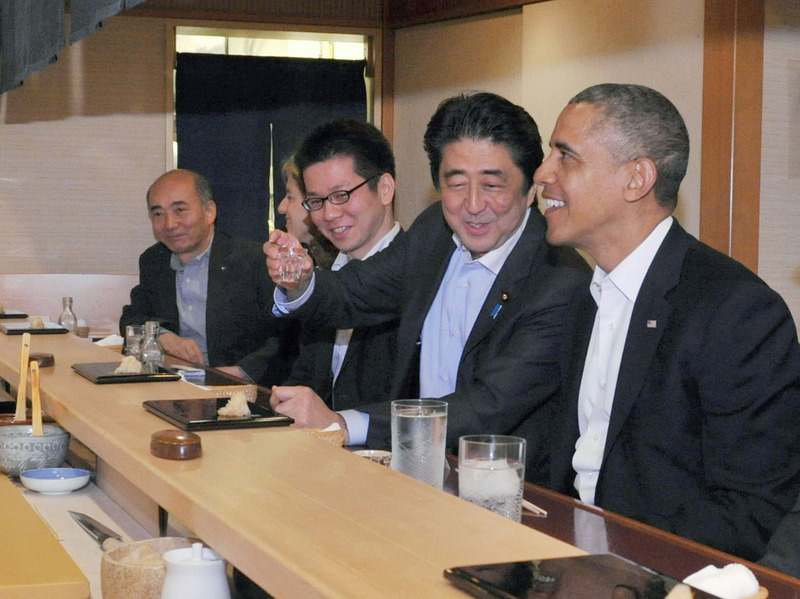 Pictures showed the US president being served sake by Japanese Prime Minister Shinzo Abe at the counter of the tiny Tokyo eatery. 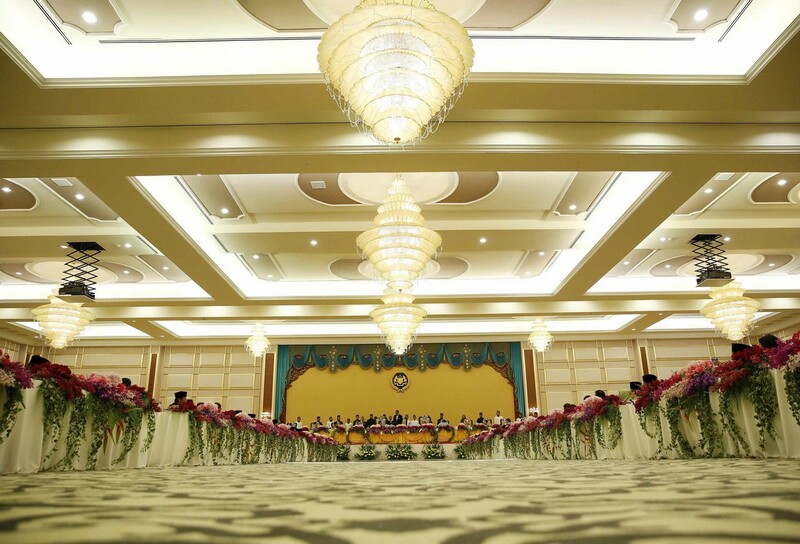 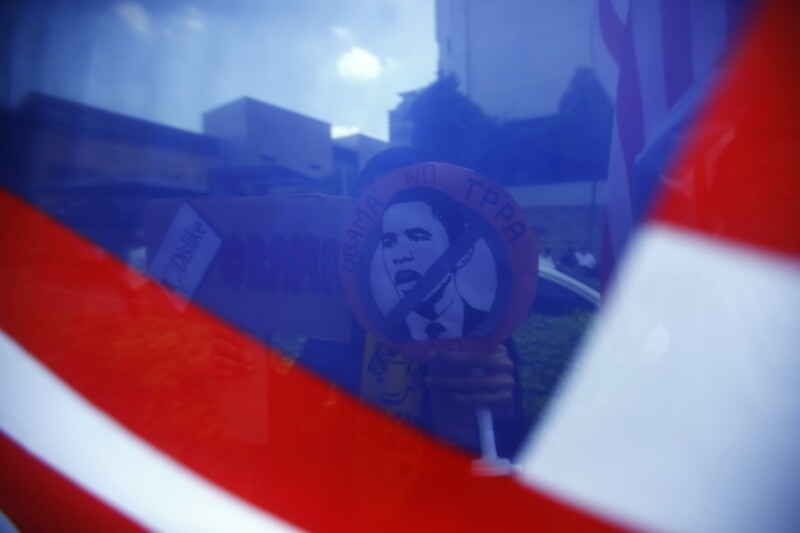 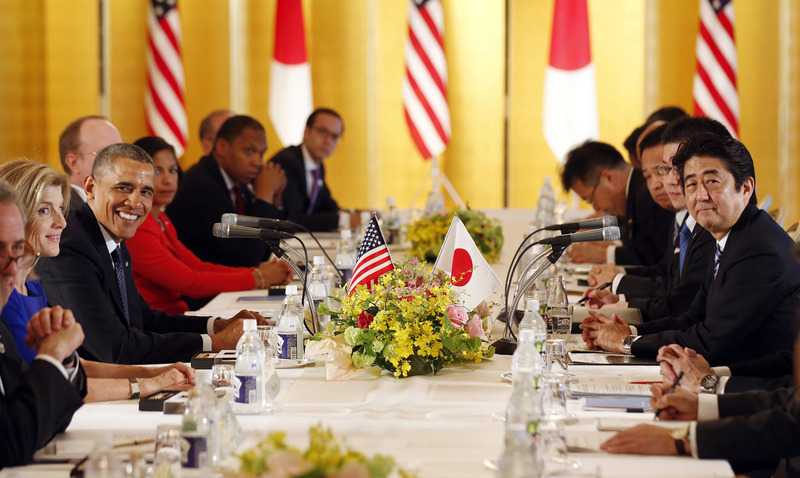 But a report Thursday said instead of making small talk and savouring Japanese delicacies, Obama jumped straight into discussions about trade. 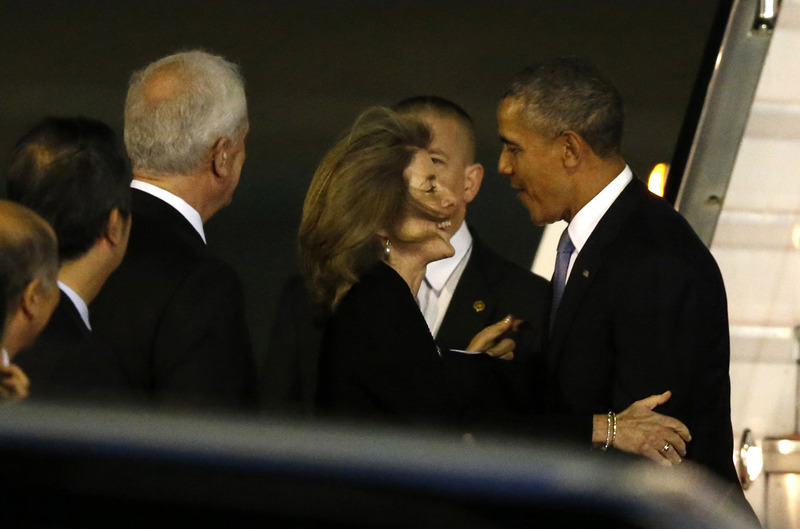 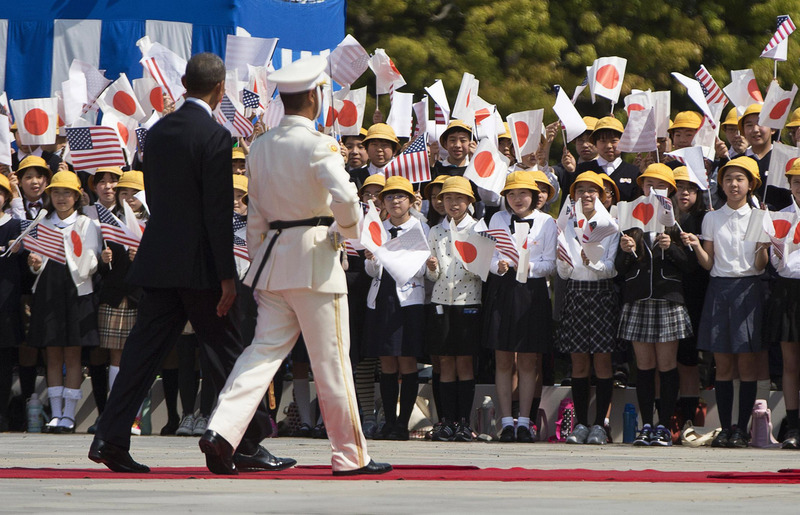 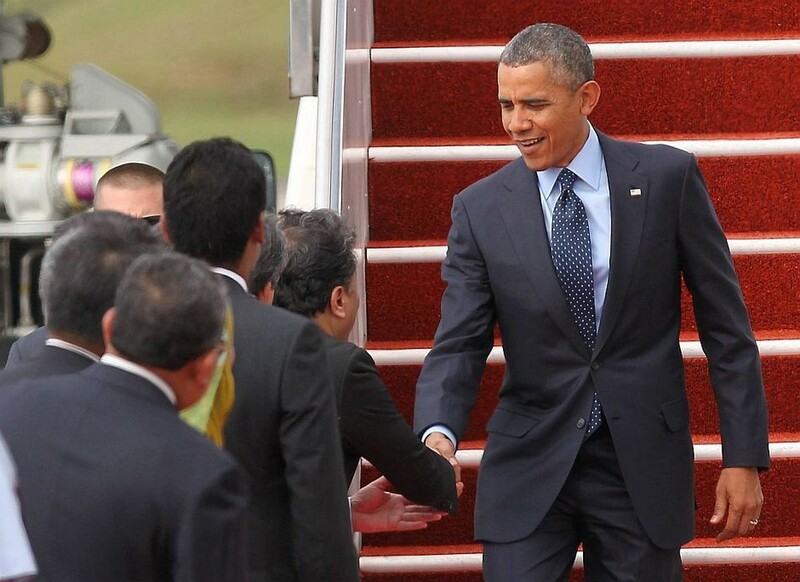 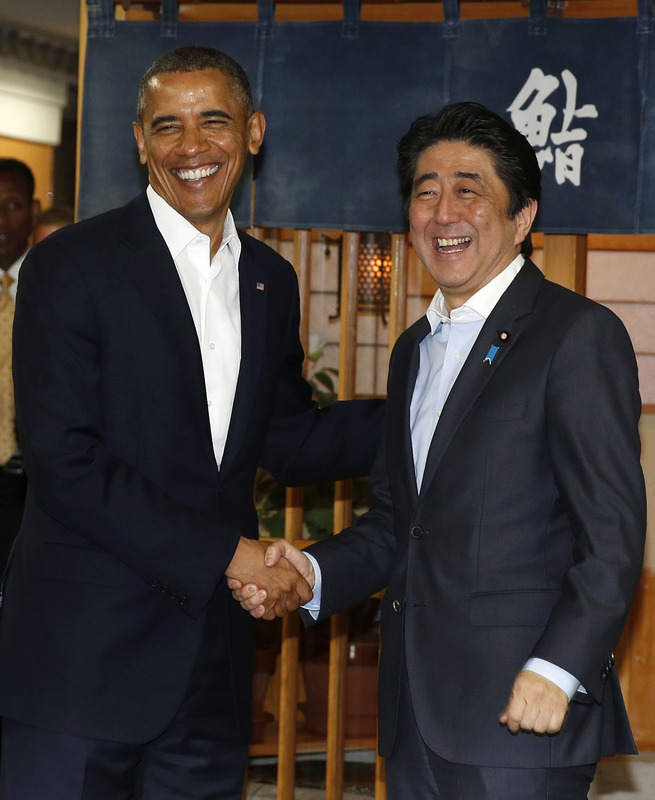 Obama's chief task, as far as Japan is concerned, is to offer reassurances that Washington is standing by Tokyo's side. 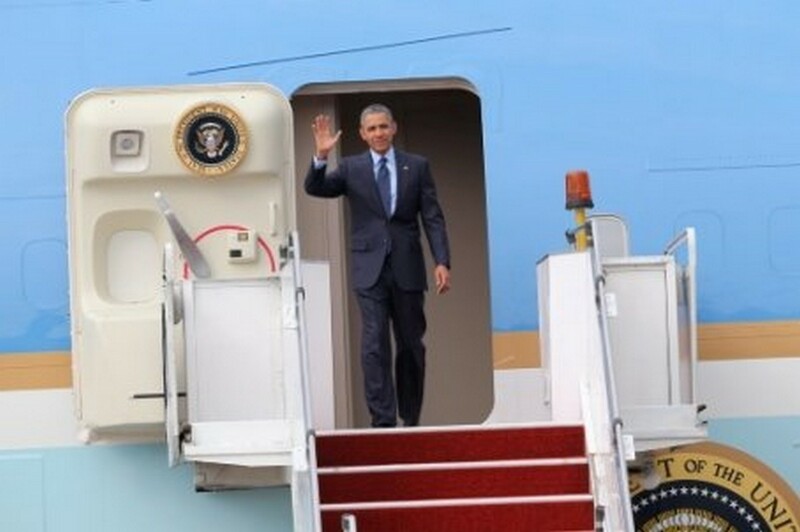 The trip will give Obama, who has met Abe briefly several times at international summits and at the White House, a chance to forge a personal connection with the Japanese premier. 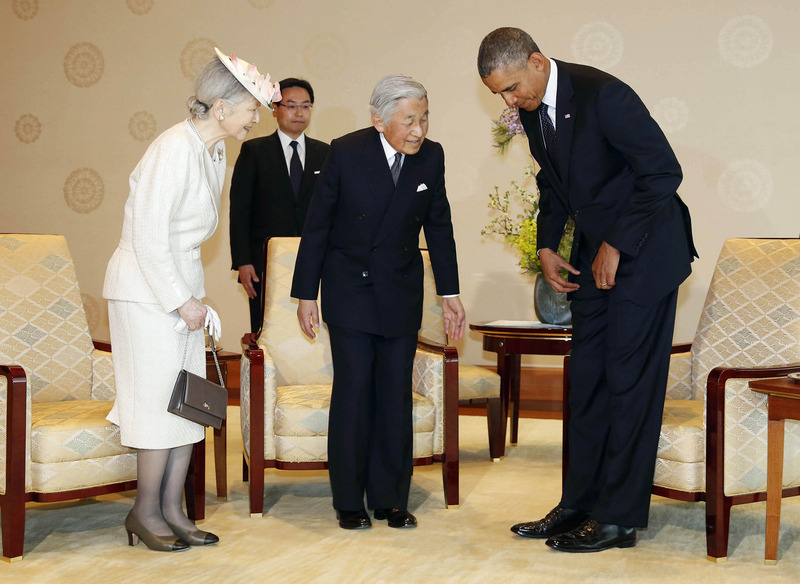 US President Obama shakes hands with Japan's Crown Prince Naruhito as Japan's Emperor Akihito, Japan's Prime Minister Shinzo Abe and his wife Akie look on. 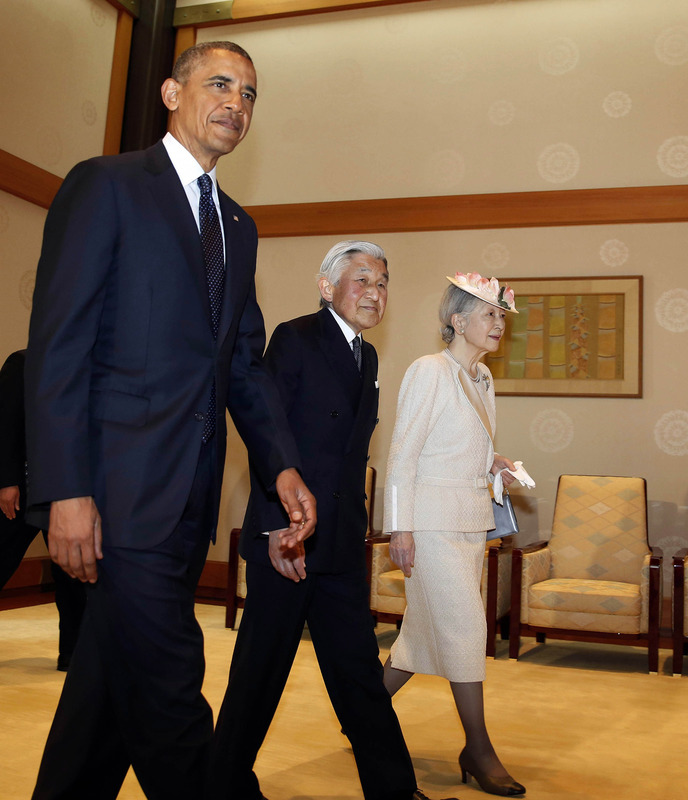 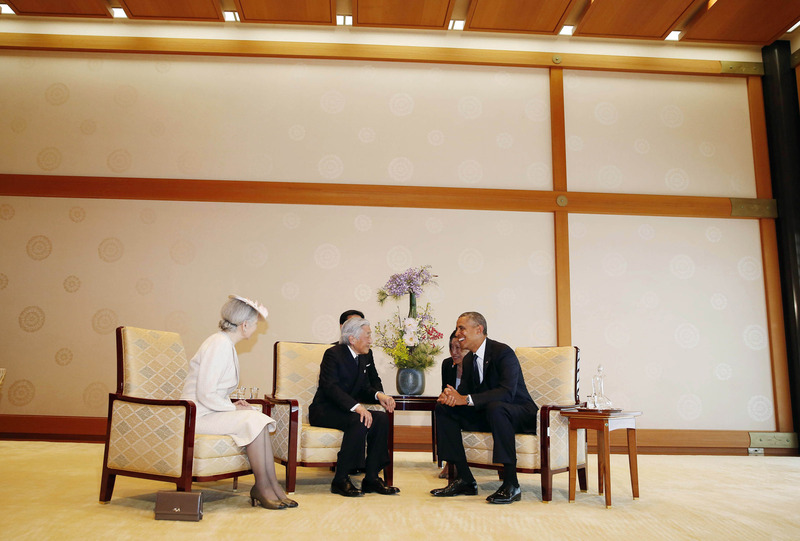 US President Barack Obama (L) is welcomed by Japan's Emperor Akihito and Emporess Michiko (R) upon his arrival at the Imperial Palace for a welcoming ceremony in Tokyo on April 24, 2014. 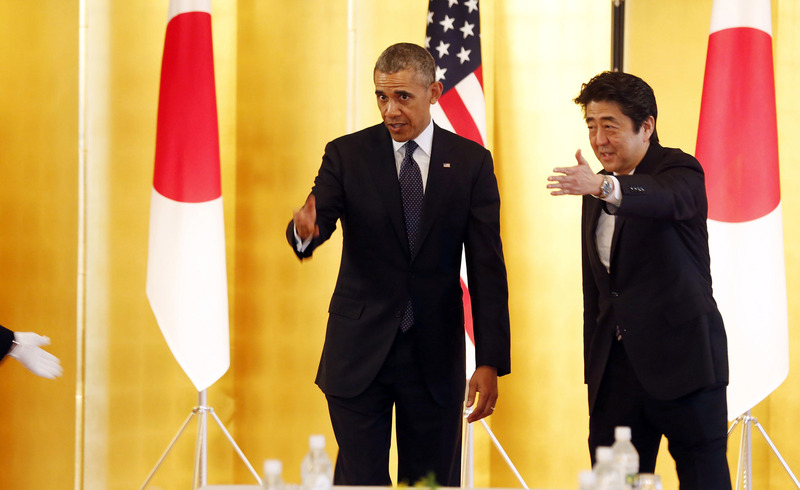 On Thursday, Obama told a press conference in Japan that islands at the centre of a bitter territorial dispute with China are covered by a defence treaty. 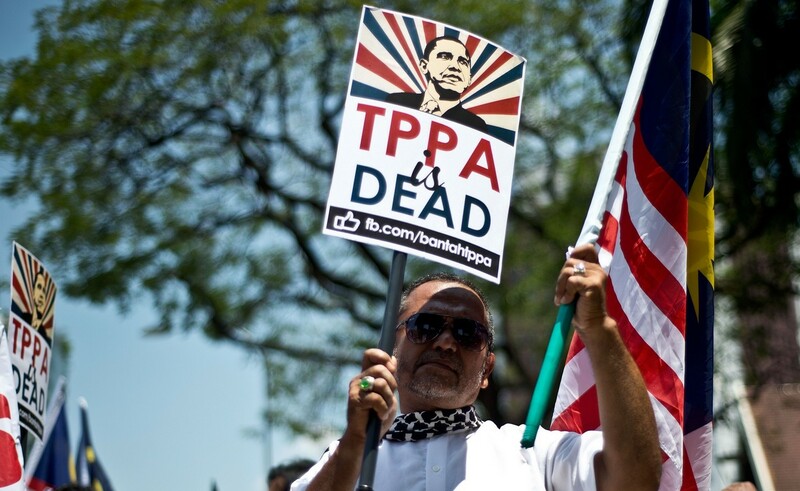 And the treaty would oblige Washington to act if they were attacked. 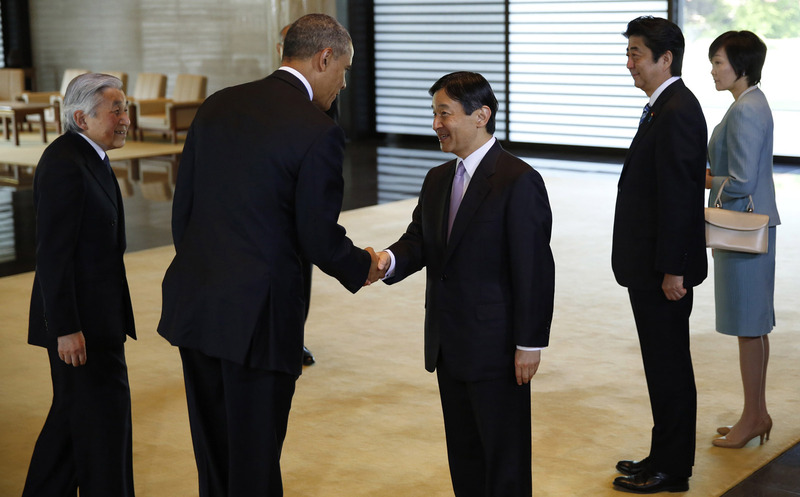 Obama plans to flesh out his vision for his "rebalancing" strategy, and ease consternation in Japan about what exactly Washington and Beijing intend when they talk of a new "great power" relationship. 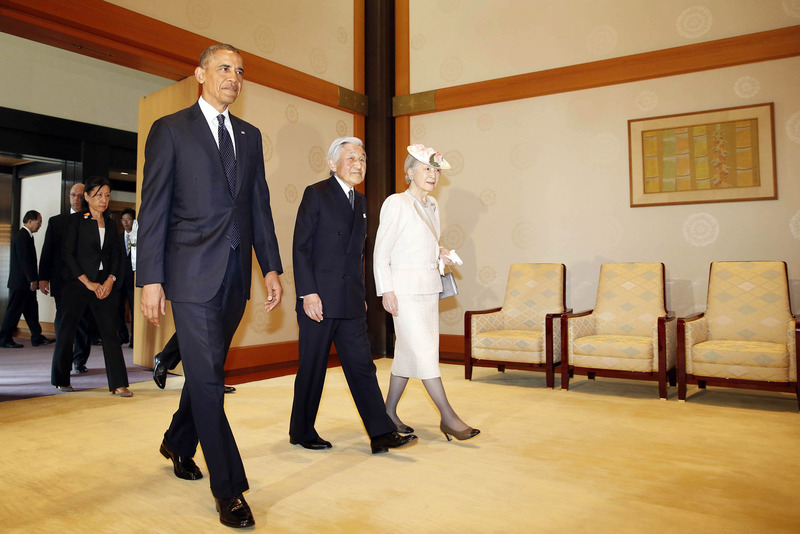 US President Barack Obama is welcomed by Japan's Emperor Akihito and Emporess Michiko upon his arrival at the Imperial Palace for a welcoming ceremony in Tokyo.